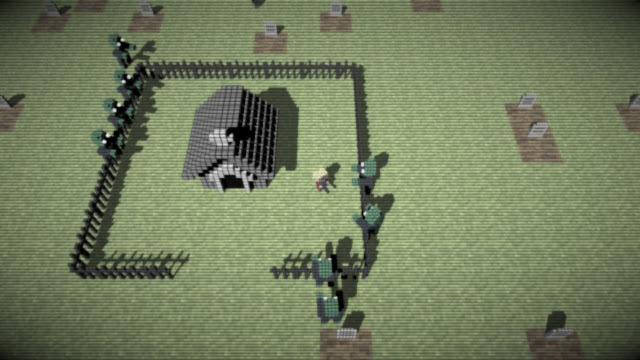 I've been playing around with adding an effect to make Block Zombies look like it is playing on an old, crappy TV. It still needs tweaking, but it is starting to get close to what I want. Using a couple of screen-space shaders, I'm blurring, adding scanlines, desaturating and adding darkened corners. I'm not planning on using this effect in-game, but I'm thinking that the intro will be some sort of news-ticker with footage of the scene of the zombie outbreak. I've been working on adding darkness, thunder and lightning to Block Zombies. I used a modified version of the technique I used for Kung Fu FIGHT! - tweaking parameters in my bloom shader to do most of the work. Because Block Zombies is 3D, I also mess with the light direction, which does fun things with the shadows when lightning strikes. Because the effect is just manipulating lighting and bloom parameters, it is basically cost-free. I haven't added in actual rain yet, since that definitely wouldn't be cost-free, and I'm not sure I can afford the extra overhead. The glowy zombie eyes, windows and sparks are done by reserving a section of my color palette that my shaders recognize and treat as being self-lit. Here is the first work-in-progress gameplay video from Block Zombies - my next game for Xbox LIVE Indie Games. The core gameplay is mostly done, and I'm now working on adding more variety to the enemies and environments. I'm hoping to get it out the door in the next month or so. The Windows Phone 7 version of Kung Fu FIGHT! is now available! I was worried about how it would translate to the phone, but it runs really well - even with the downgrade to 30fps. I was also concerned about the touch controls, but that ended up not being a problem. If anything, I think I might prefer the phone version to the Xbox one - it works really well with the "pick up and play for a bit" affordance that the handheld device offers.